Holiday gift guides seem to be almost exclusively terrible, particularly those aimed at “geeks”, whatever people think that means. In particular these lists are often split by gender, presumably because they’re written by (or pandering to) idiots. And they’re typically full of novelties or cute ideas that in practice will just occupy valuable space and you’d feel guilty about giving away or recycling. 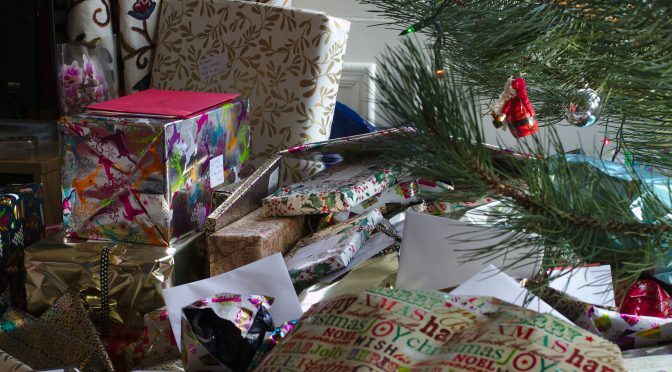 This post is my attempt to write a list of ideas which I think has (mostly) genuinely useful presents on it, based on things we’ve owned and used for a while. I’m quite conflicted about this exercise, I should probably say. Different families and social groups have very different present-giving cultures, but for many people in a similarly lucky position to me, getting consumer items that you don’t really want, or a subtly wrong variant of something you do want, is worse than getting nothing at all, and much worse than the person giving money to a charity instead. That said, maybe these lists are useful as a basis for things people might suggest and discuss before giving as presents? You can get gloves with conductive material in the fingertips from loads of places nowadays, in fact. The idea is that you can use capacitive touch-screens, like those on your phone or tablet, without removing your gloves. These Muji ones are pretty cheap, and work OK – I find you need a bit more pressure than without the gloves to get them to work, but it’s fine. To avoid further damage to my hearing nowadays, I always take ear plugs with a fairly flat frequency response along to gigs. They can never be ideal: you often get a huge amount of bass sound through bone conduction at loud gigs, and the ear plugs can’t do anything about that. It’s probably better to have rather too bassy sound than damage your hearing, though. The ones I’ve linked to from the heading have switchable filters for different levels of sound attenuation – the ones I have don’t have that feature, but in retrospect it would have been nice if they did. I carry these in my bag all the time, and it’s also frequently useful for blocking out sound on public transport as well, to give yourself some peace and quiet. I think it’s always possible to think of a fun new project that a Raspberry Pi would be useful for, and the Pi 3 is a big step forward from the previous models, having Wi-Fi and Bluetooth built-in. I really like the lovely Pimoroni cases, like these, which I got for our Pi 3, and they do other nice accessories. NiMH rechargeable batteries are really good nowadays, and save you quite a bit of money if you have lots of devices that use AA / AAA batteries. We got this battery charger in part because I believe it is the same model, albeit with different branding, as the Wirecutter’s “Also Great” pick – it has more features than their basic suggestion. (There’s a useful FAQ for it in an Amazon review of the US version.) Although the UI isn’t very intuitive, you can use the device to calculate the capacity of your existing batteries, which is really helpful – when we first got it I went through all of our existing rechargeable batteries to work out which were worth keeping and which should be replaced. My friend and colleague Dave Whiteland wrote an amazing of series of books called “The Knot Shop Man”, which are described as being for “smart children or thoughtful adults”. The theme of knots runs through all the books (which you can read in any order) and they come bound up in a very special knot. (After finishing reading them, you should try to retie it. :)) Not enough people know about these books, and I think the ones he’s selling at the moment are limited in quantity. If you don’t have any Network Attached Storage, I think you’ll be surprised at how soon you come to rely on it, both for backups and for storing music and videos on to stream to your phone, TV, or whatever. This is our favourite way of making coffee, for one or possibly two people. These are a lovely design, which makes a UK 3-pin plug take up less space by letting you fold it away, and provides 2.4A USB port. Presents that are experiences rather than things-that-take-up-physical-space often work out well. An interesting one of these we did is a course in butchery at the Ginger Pig – you can do a class on pork, beef or lamb and you get both a big meal and a lot of meat to take away, as well as learning about what each cut of meat is good for. (I have an earlier version of these, but the QC25 seems to be the current equivalent.) I gather that headphone connoisseurs don’t particularly rate the sound quality of these, but basically everyone agrees that the noise cancelling is amazing. (The sounds seems great to me, for what it’s worth, but I’m not an audiophile.) For long coach, train and plane trips they’re fabulous, if quite bulky to take with you. They are expensive, though. This is a set of 5 little sliding webcam covers. The idea is that if someone malicious gains remote access to your computer, then the impact if they can also see everything from your webcam is much worse than if they can’t. These little windows are really cheap and mean that you can just open the webcam window when you actually need it. I think I probably drop my phone about once a day, but haven’t had smashed its screen yet, thanks to having a good bumper case and screen protector. The Ringke Fusion line of bumper cases (which they seem to do for most current phones) are the ones I’ve used for a while, and as a very clumsy person I can testify that they protect your smartphone very well. As a screen protector I’m currently using one of the “Invisible Defender Glass” models. How many HDMI inputs does it have? … since having at least 5 is useful, and plenty of the cheaper devices on the market only have inputs for 3 or 4 HDMI devices. HDMI-CEC remote control pass-through. This means that when you press the arrow keys, play, pause, etc. on the AV receiver’s remote control, those commands are sent to the HDMI input device that’s currently active. Why is that useful? In our case, because two of the connected devices are a Raspberry Pi (running Kodi) and a Playstation 4, both which can be controlled this way just from the AV receiver’s remote control. ³ Without this feature we’d need to get an IR receiver for the Raspberry Pi or have a Bluetooth keyboard by the sofa, and use the PS4’s Dualshock 4 controller, which isn’t great as a remote control – the shoulder buttons tend to get pushed when you put it down. Even if we got those alternatives controllers, it’d mean two additional remote controls to juggle. Very variably supported – even devices that claim to support HDMI-CEC ⁴ don’t necessarily do the remote control pass-through. Not widely known about – the two otherwise well-informed people I spoke to at Richer Sounds hadn’t even heard of this feature. Not typically listed in manufacturers’ specifications, so it’s very hard to tell if a device you’re going to buy will actually support it. Clearly I’m missing something about the world of home cinema / Hi-Fi, otherwise more people would know and care about this feature. The number of different remote controls you need is one of the most obvious ways that usability of home cinema systems tends to be awful. Is it the case that most of the people in the market for AV receivers don’t care about this? Do they live with people who aren’t Hi-Fi enthusiasts, and how do those people deal with it? 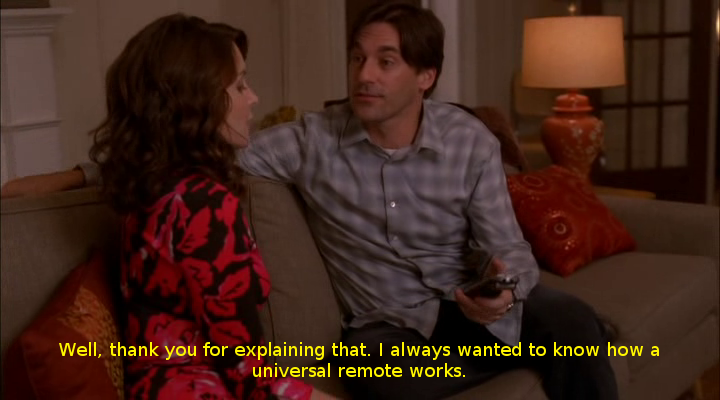 Perhaps they just live with the complexity: they keep four or five remote controls around all the time, and effectively write an operations manual for their families or house guests who might need to try something as extraordinary as, I dunno, watching TV, or using Netflix. Of course, you can buy all-in-one remote controls that can be taught the IR signals sent by any of your existing remote controls so that they can be sent from one device. Maybe these are much more popular than I imagine? I can’t think of anyone I know who has one, but obviously that’s not a very representative sample. The problems with an all-in-one IR remote control for us would be that (a) the PS4 controller uses Bluetooth, so it wouldn’t work for that, and (b) we’d still need to get an IR receiver + remote for the Raspberry Pi. In any case, these devices seems so inelegant compared to the HDMI-CEC solution – why should the remote control have to preserve the state indicating which device’s IR codes should be sent? With the CEC approach, the AV receiver knows which source is active and it should send the command to. This seems quite likely, and if it’s correct, I’d really like to know what the answer is! Maybe everyone with several media players connected to their AV receiver these days is controlling them with terrible iPad apps, or telekinesis or something. My guess is that usability by non-experts has never been a big concern to manufacturers of relatively expensive AV equipment; usability isn’t their central concern in the way that it is for Amazon or Zipcar, say. Their market seems to care a lot about things that matter little to me (e.g. huge numbers of surround speakers, differences in audio quality that are difficult to detect, etc.) and maybe they think that their target market just doesn’t care about the inconvenience of needing five or so remote controls in reach. For music alone, I suppose people who care about usability (but not necessarily open standards) are well served by iPhone docks with active speakers, or systems like Sonos. I’m not sure if there are corresponding solutions that are easier for people to use if you have multiple media sources that include video too. 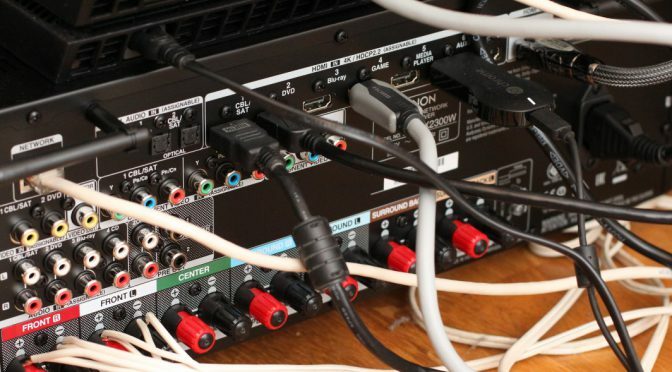 Returning the current replacement receiver I bought (a Denon model that advertises HDMI-CEC support, but doesn’t send the remote control commands, grrr⁵), which a hassle, and probably involves explaining this blog post to people at Richer Sounds, which I don’t relish. Then trying to find a replacement that does support this feature. Living with the additional complexity. Something that would mitigate that problem a bit would be getting the PS4 universal remote control, which is a bit like an all-in-one remote that also speaks the PS4’s bluetooth controller protocol. We’d need to get an IR receiver / remote control for the Raspberry Pi, too, of course. Anyway, this all seems very unsatisfactory to me, but maybe I’m missing something really obvious. ¹ One lesson from this experience, which in retrospect should have been obvious, is that if you have a surge-protected extension lead with a “SURGE PROTECTED WHEN LIT” indicator light, it’s not doing any surge protection if that light’s off — it being off typically means it’s protected you from some surge in the past and isn’t providing protection any more; some kind of fuse in it has blown. A PlayStation 4, for games, Netflix, Amazon Prime Video, DVDs and Blu-Rays. A Raspberry Pi running Kodi, for playing audio files and films and TV that I’ve ripped. A Chromecast, which we stream music and YouTube video to. So basically it’s a way of having audio and video on the best output devices in the flat, no matter what the input source is. ³ I’m making it sound like the remote control pass-through worked perfectly with our old AV receiver; that’s not quite the case. The one big annoyance was that there was no way to do the equivalent of pressing the “Playstation” button on the PS4’s DualShock 4 controller, which you need to turn it on and select a user. Otherwise it did basically send all the commands we needed for watching streaming video, DVDs and Blu-Rays on the PS4, and everything we needed to operate Kodi from day-to-day. ⁴ I gather from hearsay that HDMI-CEC support in general is a bit of mess: whether it’s because the specification isn’t strict enough or manufacturers are just implementing it very differently isn’t clear to me. Maybe someone can summarize that? (We’ve certainly had problems in the past with the power state change signals causing devices to power on again after you’ve just shut another one down, for example.) Still, the remote control pass-through worked well for us. I recently bought a Denon AVR-X2300W AV receiver, which claims in the specification on your website to support HDMI-CEC. However, the feature of HDMI-CEC that I really need doesn’t seem to be working: remote control pass-through. To be clear, this means that when I use arrow buttons, play button, etc. on the AVR-X2300W’s remote control, those commands should be sent to the current HDMI source device. This doesn’t work, although I have Setup > Video > HDMI Setup > HDMI Control set to “On”. I can’t see any other option in that menu that might turn on that particular feature of HDMI-CEC. This is a really crucial feature for me, and it worked fine on the (much cheaper!) Yamaha AV receiver I had previously. Is there some other option I need to select to enable HDMI-CEC remote control pass-through or any way to get this to work? CEC protocol is a standard but its mandatory definitions do not include many features and functionality. These are considered as extended features and may or may not be implemented by different manufacturers. You maybe simply experiencing the difference in different manufacturers implementation of CEC. As a consumer the only potential solution for this would be ensuring that all equipment is running on the latest version of firmware. ( relevant settings should also be made on the equipment ). As extended features are not guaranteed you may need to use alternative methods for control.